Why wasn’t my photography teacher this brilliant? As Peta Pixel reports, an associate professor at the University of Central Oklahoma, Mark Zimmerman, recently turned his entire classroom into a giant camera obscura to teach his students how old school cameras worked. In case you’re unfamiliar with the concept, camera obscuras (sometimes called pinhole cameras) are basically the most primitive form of photography. It’s essentially used to describe what happens when a bright light from one side of a screen is projected through a small hole. When the image passes through the hole, it is reversed and inverted. It’s a crazy, natural phenomenon and happens because of the way light travels. To pull off the demonstration, Zimmerman first covered all the windows in his classroom with aluminum foil and duct tape, to ensure that there was no natural light entering the room. He left a small, square hold in the center window that essentially served as the camera obscura’s lens. 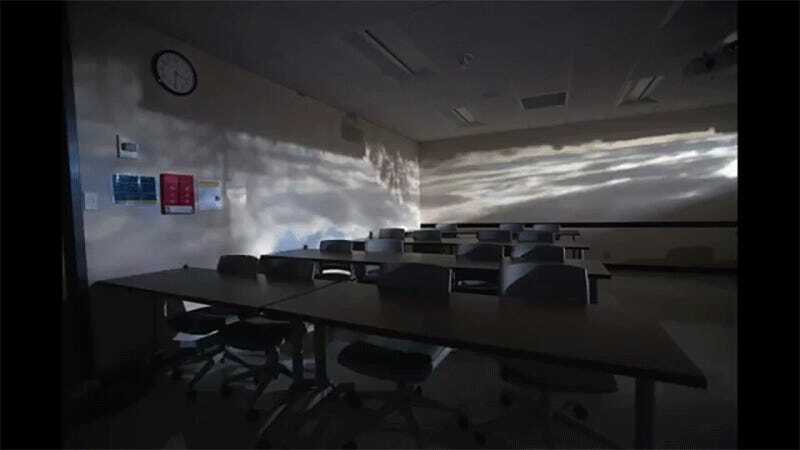 The result was a classroom with scenes of the outside world projected upside down. He also created a neat timelapse for everyone to see. I just wish my teachers were this creative with their lesson plans. Bike Showdown: Which Easy-to-Build, Low-Maintenance Bike Should You Buy?